The book presents a mixed research method adopted to assess and present the Toyota Way practices within construction firms in general and for firms in China specifically. The results of an extensive structured questionnaire survey based on the Toyota Way-styled attributes identified were developed and data collected from building professionals working in construction firms is presented. The quantitative data presented in the book explains the status quo of the Toyota Way-styled practices implemented in the construction industry, as well as the extent to which these attributes were perceived for lean construction management. The book highlights all the actionable attributes derived from the Toyota Way model appreciated by the building professionals, but alerts the readers that some attributes felled short of implementation. Further findings from in-depth interviews and case studies are also presented in the book to provide to readers an understanding how these Toyota Way practices can be implemented in real-life projects. 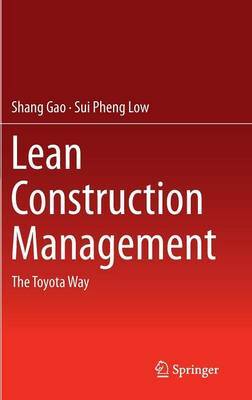 Collectively, all the empirical findings presented in this book can serve to enhance understanding of Toyota Way practices in the lean construction management context. The readers are then guided through to understand the gaps between actual practice and Toyota Way-styled practices, and the measures that they may undertake to circumvent the challenges for implementation. The book also presents to readers the SWOT analysis that addresses the strengths, weaknesses, opportunities and threats towards the implementation of the Toyota Way in the construction industry. The book prescribes the Toyota Way model for use in construction firms to strategically implement lean construction management. The checklist presented in the book enables readers to draw lessons that may be used additionally as a holistic assessment tool for measuring the maturity of firms with respect to their Toyota Way implementation. Consequent to this, management would then be in a better position to develop plans for Toyota Way implementation by focusing on weak areas, strengthening them, and thus increasing the likelihood of success in the implementation of the Toyota Way. In a nutshell, this book provides a comprehensive and valuable resource for firms not only in the construction industry but also businesses outside of the construction sector to better understand the Toyota Way and how this understanding can translate to implementation of lean construction/business management to enhance profitability and survivability in an increasingly competitive global market place.